Art is one of those topics that is consistently sneered at in the media as being unimportant, frivolous, or ineffectual. It’s the first program to get cut in our schools, and those of us who choose it as a vocation (like me, for example), are frequently met with questions like, “Huh. What are you going to do for a living?” when people are being nice, and something far snarkier when someone is feeling a little mean. Even President Barack Obama made an off-the-cuff remark in 2014, suggesting that people should invest more in manufacturing and tradesmanship than in art history degrees. For many, extended education in the arts seems like a one-way trip to the unemployment office. Given this type of criticism-- whether it is warranted or not-- it is increasingly important for individuals to not just support the arts in their communities, but to look back through periods of history where artists were applauded for making a significant difference. And in the case of one very special American troop in the midst of World War Two, artists and creative types were tasked specifically with using their skills to preserve people. Art here became a life-saving force- literally. A force for good, even through multiple means of deception. Some people think that visual art is dry, boring, lifeless. But the stories behind those can be paintings, sculptures, drawings and photographs are weirder, crazier, or more fun than you can imagine. And today, we’re looking into a troop of artists who constructed a false army-- a Ghost Army-- in order to steer Axis troops astray and save thousands of lives. 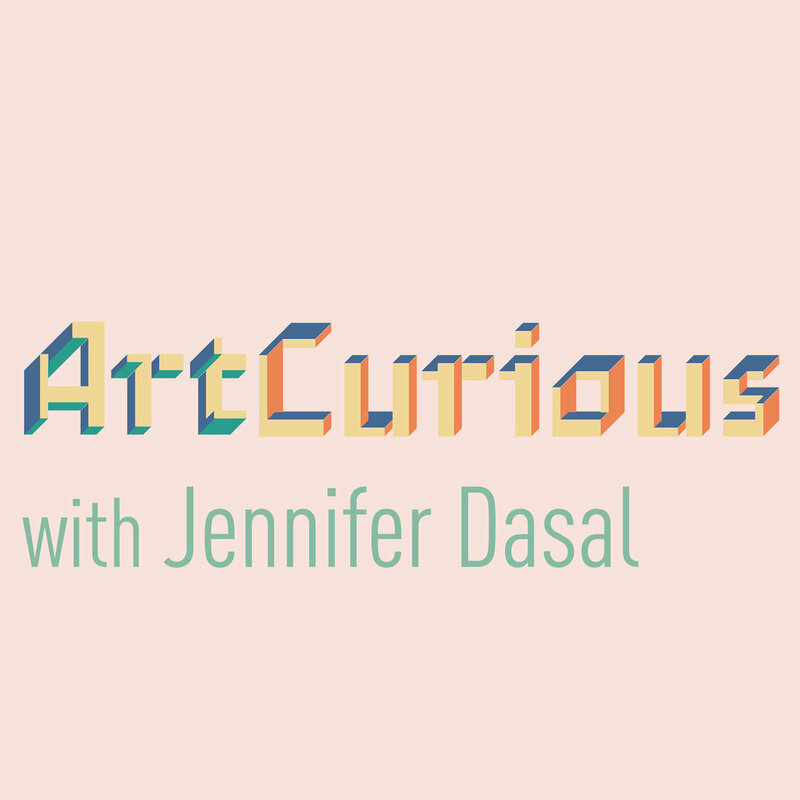 Welcome to the ArtCurious Podcast, exploring the unexpected, the slightly odd, and the strangely wonderful in Art History. I'm Jennifer Dasal. If you’ve never heard about the Ghost Army, you’re not alone. I myself had never heard of the existence of such a thing-- and indeed, it was kept a top-secret mission of World War Two all the way until the 1980s. But such a thing immediately reminds me that truth is indeed stranger than fiction, because the premise of this tactical operation is just plain crazy. It was all about using art, visual effects, and even sound design to fool Hitler’s army, turning them away from actual stationed troops towards false “dummy” troops. And all of this was done, by the way, without the use--or even accompaniment-- of weapons. Like I said: crazy. But though every single mission wasn’t always a runaway success, this bonkers plan actually worked, and went down in history as an incredibly innovative and creative wartime accomplishment. We already talked about how artists were involved in the documentation of World War Two in the third episode of this season, which featured combat artists-- artists whose jobs it was to go into battle alongside other soldiers and sketch (and then paint) in order to document what war was actually like for those in the trenches. These artists weren’t necessarily engaging in the battle or participating in the action, so to speak-- not there to strategize or to fight, but instead they were there to witness, and to bring their experiences home to civilians. In the case of the development of the Ghost Army, though, artists and designers were targeted early on in order to flesh out, coordinate, and ultimately act on a wild plan that was concocted by the U.S. Army only weeks after the bombing of Pearl Harbor on December 7, 1941. The original idea for the Ghost Army was conceived mostly by two men: Army officers Ralph Ingersoll and Billy Harris, who found themselves fascinated with some of the deception techniques that were employed, to great effect, by the British Army. In 1942, the British successfully deployed Operation Bertram during the Second Battle of El Alamein, where camouflage and false radio announcements came together to coerce the enemy troops into believing that the Allies planned to attack at a particular time and location-- which happened to be totally untrue. Because of this, the Allies won this particular battle, which led Winston Churchill to announce to the House of Commons, quote, “By a marvelous system of camouflage, complete tactical surprise was achieved in the desert.” I know that might not sound like much, but that’s pretty much a way of saying “Whoohoo!” with traditional British restraint. Ralph Ingersoll and Billy Harris were impressed with this mission--and especially its outcome, naturally. In particular, Ingersoll, who would go on to be a prominent writer, editor, and publisher, was a true American in his can-do attitude and his belief that he could do things bigger and better-- and that was certainly the case with his hopes for his so-called “mobile deception unit.” If the Brits could make a successful deception, by golly, the U.S. could take it to the next level. And so, upon their suggestion, the U.S. Military sought the most creative out-of-the-box thinkers that they could find: advertising copywriters, actors, and artists. That actors, by the way, would become hugely important to the cause will become even clearer as this episode progresses, but suffice to say that in looking for an easy way to describe the Ghost Army, it occurred to me that it was really like putting together a very realistic stage play, or some ultra-believable special effects for a wartime film. Because that’s really what this boils down to-- an incredible group of people who acted and set-dressed their way into diverting Axis troops in mainland Europe. Filmmaker and author Rick Beyer, who created a documentary in 2013 simply titled The Ghost Army, described them later as a quote “traveling road show,” an apt description if there ever was one. And in a humorous tangent, it does seem that Hollywood wanted to take credit for what would ultimately be a very creative and successful endeavor-- one report refutes that Ingersoll and Harris were the brains behind the concept of the Ghost Army, and suggested that it was instead spearheaded by Douglas Fairbanks Jr., himself an actor and also a captain in the U.S. Navy during the war. How did the Ghost Army come together? Well, imagine, for a second, that you are an art student in some elite American college, creating drawings or designs for various professors or projects. All of a sudden, you’re met by a recruitment agent--someone from the government, even!-- for a top-secret assignment. This is exactly what happened to Ghost Army recruits, and in a blink of an eye, over one thousand men-- including some individuals who would late become big names in the art and design worlds, like Ellsworth Kelly and Bill Blass--were brought together to comprise a very unique unit of the U.S. Army known as the 23rd Headquarters Special Troops, or Operation Quicksilver. So, what was the 23rd Headquarters Special Troops going to do? Oh, not much, really. They were just going to completely create a so-called “deception unit,” which would take the form of a large movable encampment of tanks, soldiers, and weaponry-- completely made of disposable or lightweight materials and almost totally unmanned, able to be disassembled at a moment’s notice and made to disappear almost as quickly as it had appeared. Hence, the nickname later imposed upon this project, which was essentially a functional art installation: the Ghost Army. The essential job of the Ghost Army was to act as if they were actually a much larger, much more important Allied troop-- essentially impersonating a troop ten to fifteen times larger than the Ghost Army’s behind-the-scenes crew actually was. Some U.S. armored divisions were up to 20,000 soldiers strong, and those troops were trying to navigate the countryside in France and Italy in as secret a manner as possible in order to sidestep attacks by Hitler’s troops, for example. But moving tens of thousands of men-- and all their equipment, tanks, jeeps, and so forth-- was not a silent nor sneaky thing, typically. But how about maneuvering a bare-bones troop of cardboard cutouts, or wooden jeeps, or even canvas tanks? That’s far easier. And if the mission failed and the so-called “division” got ambushed and the deception was revealed? Well, it might mean the loss of a handful of men-- but that’s much better than 20,000 men. In the meantime, if the Ghost Army was successful, they could hope to derail German soldiers off the track of actual U.S. Army units, allowing them to progress and prepare with astonishing ease. The Ghost Army’s trickery essentially functioned on multiple levels, with the visual and audio aspects being the most important, and the most tricky. The Visual Deception team, officially called the six-hundred-and-third Camouflage Engineers, worked first and foremost to create dummy equipment that could be detailed enough that, from a distance, it would look like the real thing-- whether it be a tank, truck, airplane, cannon, or a machine gun. Artists predominantly from art schools in New York and Philadelphia came together and experimented with different materials to see just how easily something could be replicated, utilized, and transported. And like most innovations, there was a fair amount of trial and error involved. In the Ghost Army documentary, you can watch footage of the different prototypes at play, being constructed and tested for use. Tanks made of cardboard or wood were nixed pretty quickly, because their materials were prone to breakage, and also because two-dimensions might work for some things, but a three-dimensional appearance was really key to being able to successfully pull off the trickery. Canvas was attempted for a time, but ultimately, one material proved to be the most successful, the easiest to maneuver, and the sturdiest: rubber that would be inflated via the use of air compressors and strategically installed in just a couple of hours. Essentially, this meant that the Nazis were being outfoxed by some big rubber tank balloons. Come on. That’s just cool. Not that it would be a perfect system. Remember that from up close, the deception was overt and dangerously obvious. But from a distance and with the right kind of additional masking methods thrown into the mix-- think traditional camouflage netting, for example-- the appearance could really be quite impressive. On top of all that, the artists recruited as part of Operation Quicksilver took their jobs very seriously, and attempted to mimic the appearance of little details to add to the realism of any given scene. One of my favorite details is that dummy bivouacs were created to look like they had laundry lines drying off to the side of them-- a mundane touch that reminds us that in war, every little thing counts, and you can never go too far in an attempt to outwit your opponent. And the details weren’t limited to the dummy items themselves, but also their surroundings-- for example, if you were to see a slough of tanks a few hundred meters away, it might look okay. But what if you spotted the same thing from the air, and noticed that there was a mysterious lack of tank tracks around them? Of course, tanks just couldn’t teleport to a location-- they had to be driven there. And if there was no proof of those drives, then that could tip off the enemy immediately. So troops even brought in bulldozers to make fake tracks around a fake encampment. What else did the Ghost Army have up their sleeves? Plenty. That’s coming up next, right after this break. Welcome back to ArtCurious. A reliance on visual trickery was only one component of the Ghost Army’s repertoire. Another very important element was the usage of highly efficient sonic effects. Hidden among tree groves and under camouflage, giant speakers and amplifiers produced sound effects-- everything from the sound of rolling tanks to marching soldiers, to men shouting-- which could be heard up to 15 miles away. All of this was handled by a special Ghost Army crew called the 3132 Signal Service Company Special who, along with engineers from the historic Bell Labs in New Jersey, designed and mixed a wide variety of sounds depending on a huge range of possibilities-- what kind of weather a locale would be experiencing; what kind of terrain men would march over; what type of scenario or appearance the Army would want the enemy to believe; and so forth. One of the interesting things about this-- besides how detailed it was-- was how new the technology was as well. The recordings were done on magnetic wire recorders, a kind of predecessor to tape recorders, and was so innovative in military usage, in particular, that the Army produced a secret film specifically to explain its process to top officials. You can actually see some of the footage in the Ghost Army documentary. But even that wasn’t all. A third component of the Ghost Army’s success were its radio operations, sometimes nicknamed “Spoof Radio,” and handled by the 3132 Signal Service Company Special. As was well-known at the time, the Germans listened in to supposedly top-secret radio communications from Allied troops around Europe, and thus it would be a huge oversight on the part of the U.S. military if, somehow, there was this random troop, or troops, strangely silent over the airwaves. So radio engineers and operators needed to be able to fabricate the right types of messages to bluff their furtive listeners. Operators here had to be the best mimics possible, learning complicated keystrokes and styles of Morse code in order to properly pull off the deception. While sending false coded messages out over the radio wasn’t a new tactic, it was its usage in conjunction with the sound effects and the inflatable dummies that made this an incredibly well-rounded and unique undertaking. The mimicry of those assigned to radio operations brings to mind an unexpected fourth aspect of the Ghost Army’s tactics. Remember earlier in the episode when we noted the presence of actors in the Army’s ranks? The few individuals who were stationed in and around the bogus encampments also had to play their roles up to anyone who happened to be nearby, especially when it came to passing through local villages. In France, for example, Ghost Army associates would pair up in restaurants or bars of various small towns, and they’d talk shop. They’d impersonate soldiers or military personnel, pretend to get a little too relaxed over good red wine, and loudly share phony details about upcoming battles and current stationed troops-- with the intention that someone might overhear them… and report them to German spies or the authorities. But of course that wasn’t all. They also used the visual artists at their disposal to make fake patches of whatever troop they were impersonating, as well as designing stencils and insignia to be used on official vehicles. When need be, though, a few real tanks or trucks would be requisitioned for the Ghost Army to use, just in case there was a need to make them more believable upon slightly closer inspection. What’s interesting to me is that all of this hard work, shrewd trickery, and innovative effort was only put into effect over the course of less than one year-- between the months of June 1944 and March 1945. In that time, though, the Ghost Army was constantly on the move and able to carry out just shy of two dozen missions, with each one growing more deceptive and ingenious in attempting to guide the Germans further away from actual U.S. troops. And in many of these intense missions-- some of which took them precariously close to German lines-- they came under fire but had practically no casualties-- only three deaths were reported in 21 separate missions during some of the worst fighting in Europe. And even those three deaths can be spun to have a silver lining. Think about it-- would the Ghost Army’s false campsites and troops have come under fire if they hadn’t been successfully impersonating U.S. soldiers? The most important and most dangerous mission faced by the Ghost Army just happened to be its last, occurring in late March of 14945 at the banks of the Rhine River in Germany. The Rhine formed a major border between France and Germany, and the U.S. needed to cross it in order to prepare an attack upon the Germans-- and do so without being detected. So, call in the Ghost Army, for what would become known as Operation Viersen. By far, this required the largest amount of participation from the 23rd Headquarters Special Troops-- all 1100 men were called aboard in order to impersonate two separate American divisions totaling close to 40 thousand men. That’s less than 3% of the actual manpower in those two divisions-- so you can imagine that the amount of trickery was staggering to pull off such a huge deception. As always, it was a feint designed specifically to make the Germans think that the U.S. troops were doing something that they indeed were not. As Jonathan Gawne, author of the book Ghosts of the ETO, noted to NPR in 2007, quote, “They simulated the 30th and 79th Infantry Divisions and made it appear as though those divisions were training for a river crossing, were moving up supplies for a river crossing in one area, while the actual two divisions were moving secretly to the north and crossed in the north.” And indeed, the 23rd pulled out all the stops to make this happen. They inflated more than 600 false tanks and artillery, interspersed actual tanks and trucks to enhance the illusion, set up smokescreens to give the campfire effect, and began projecting sounds of intense construction, as if they were in the process of building a bridge over the river. They installed dummy airplanes across a constructed airfield that was so realistic that reports note that at least one small Allied observation aircraft landed on it-- wherein the pilot was hugely surprised to find himself essentially being shooed away, although you’ve gotta admit that his error could really only have helped with the illusion. In order to keep up the pretense of artillery fire-- whether real or friendly--a real Hollywood trick came in handy as crews set off flash canisters to represent explosions. According to reports, the Germans bought the facade entirely-- converging en masse across the river not from the infantry divisions actually making the crossing, but from the dummy base instead, and they even returned artillery fire of their own, though luckily, no one in the Ghost Army died in the process. And because of the total believability of the end result, Operation Viersen was considered an epic success. The 30th and 79th infantries made their crossing with only a small amount of casualties. That act alone, according to the 9th Army commanding General William Simpson, could have saved well over 10,000 lives that day alone. It’s important to note that, with only a few exceptions, such as Operation Viersen, the Ghost Army worked on a fairly small scale. Their missions were meant to derail the Germans and definitely did so on nearly every occasion-- but the Ghost Army was just a part of the greater might of the U.S. military. I’m not sure that you could point to them and say that they were necessary in winning the war on the behalf of the Allies, but they certainly were instrumental in making things move smoothly and more safely-- and to do so with such little manpower and equipment and with such a flourish of creativity is truly astounding. For the most part, though, the members of the Ghost Army were requested to keep their missions secret-- to not even tell their wives, children, friends, or parents about the incredible work they did in the service of their country. And indeed, the missions of the Ghost Army were considered so top-secret that its existence wasn’t declassified until the mid-1980s, over 40 years after the war itself had ended. The reason for this was simple-- the assumption was that the greatest threat to Postwar America was the Soviet Union. Announcing some innovative and highly successful deception techniques did not seem like the most prudent maneuver, just in case that information could fall into enemy hands and used against the U.S. in an all-out war with Russia. And so, most of the men involved with the Ghost Army kept their lips shut for decades. And now, finally, there is a major push to ensure that these individuals receive their due. In May of this year, 2017, bipartisan legislation has been introduced--not for the first time, mind you-- in both the House and the Senate to award a Congressional Gold Medal to the 23rd Headquarters Special Troops and the 3133 Signal Company Special, which performed additional sonic deception in Italy. As of the time of writing this episode, it seems that fewer than 40 members of the Ghost Army are still living, but what an incredible way to celebrate them. If you are inspired by this story and want to help bring this commendation to fruition, you can actually help! Visit ghostarmy.org/initiatives to find out how you can contact your representatives and make. This. happen. Because many other historically under-recognized World War Two units have been celebrated in recent years with similar honors, such as the Women Air Service Pilots in 2010 and the Native American Code talkers in 2008. And in our next episode, we’re going to look at another incredible group of service members and civilians who received Congressional Gold Medals in 2013 for their dedicated service to protect cultural property during and after the Second World War. That’s coming up in two weeks, on the ArtCurious Podcast. The ArtCurious Podcast is also fiscally sponsored by VAE Raleigh, a 501c3 nonprofit creativity incubator. This means that you can donate to the show and it is fully tax-deductible! Do you like this show? Show you care, and consider donating just $3-- that’s less than a good coffee at Starbucks-- to help keep us going. Follow the “Donate” links at our website for more details, and thank you. Speaking of website, you can also go there for images, information and links to our previous episodes. That site is artcuriouspodcast.com. And you can contact us via the website, email us at artcuriouspodcast@gmail.com, or find us on Facebook, Twitter and Instagram at artcuriouspod. --and remember to subscribe and review us on Apple Podcasts. It truly helps people to find our show. Check back in two weeks as we continue to explore the unexpected, the slightly odd, and the strangely wonderful in art history of the World War Two Era.